Glass blowing is a technique which was invented by Syrian craftsmen during the 1st Century BC and it has been a tradition in Aleppo being passed down through many skilled generations. Over the past 7 years the effect of the Syrian war has of course had an impact. Aleppo glassware was predominantly made by self-employed craftsmen, who kept their businesses going despite the years of extremely difficult conditions in Syria. Sadly, given the recent events in Aleppo, the ovens and glass makers are gone, and the glass is now increasingly rare. Certain places, however, have been fortunate enough to make it through unscathed. One example is Damascus, where mouth-blown glass originates from and where the glass is primarily now made by traditional Aleppo artisans. The glass-blowers used recycled glass – sorting it, breaking it, washing it to eliminate impurities, and then melting it down for re-use. The ovens used were built of brick and kept at a high temperature, the blowers worked on one colour and then added additional pigments; starting with clear glass, they would then add amber, green, blue or turquoise as required. In order to return to the clear colour, they would need to start the process again with a new oven. Once the item is blown, it is placed in the oven at a lower temperature for several hours, this process is what gives the glass its durability. Because of the hand made nature of these pieces there are sometimes bubbles and subtle imperfections in the glass. eskandar stores stock a range of Aleppo glass pieces, including glasses, champagne flutes, coffee glasses and glass decorations. These pieces are available in a range of colours – turquoise (pictured), amber, olive and transparent; not all pieces are available in all colours. Aleppo glass is available in the following eskandar stores – London, New York, Los Angeles and Chicago. Aleppo glassware is predominantly made by self-employed craftsmen, who have kept their businesses going despite the current very difficult conditions in Syria; they are proud that glass has been made in Syria for more than 2000 years, and hope to be able to continue for many more. Given the current circumstances in Syria, these pieces have limited availability and are not guaranteed for re-order. These pieces are available in a range of colours – turquoise, amber and transparent; not all pieces are available in all colours. 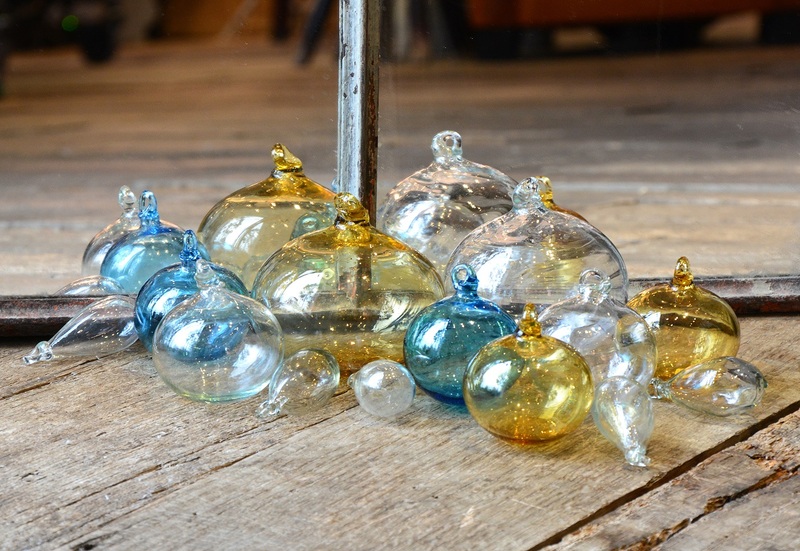 Pictured are hand-blown glass balls and drops in various colours and sizes. 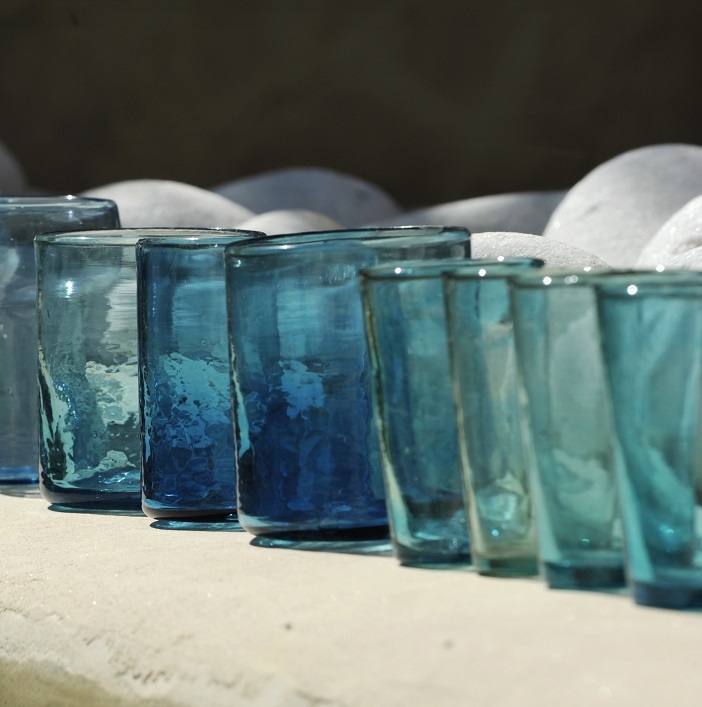 Aleppo glass is available in the following eskandar stores – London, New York and Los Angeles.